Center of Falkreath, to the southwest of Corpselight Farm. 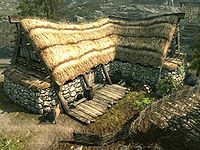 Dengeir's House is the home of the former Jarl and current Thane of Falkreath. He lives there with his brother, Thadgeir, and his maid, Tekla. It is a large L-shaped single room house. There is only one interior, zone, Dengeir's House. There is a small fenced garden at the front of the house with a tanning rack, wooden bench and several unusable barrels along the wall of the house. At the rear of the property the area has several tree stumps and a thistle, most of the area at the back is used by the wood mill which is owned and run by Bolund. There is a wood chopping block and several tree trunks by the river running behind the house. 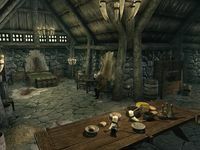 Upon entering there are two single owned beds, where Tekla and Thadgeir sleep, coming out from the southwest wall, with a dresser between them. On the dresser is a copy of Lost Legends. Opposite the entrance is a fireplace, to the left is a food barrel with a goat cheese wheel on top. There are three loose septims on the mantel and a kettle containing four potatoes by the hearth. To the right of the fireplace is a long wooden table and chair with bulb of garlic, two potatoes, three seared slaughterfish, two chicken's eggs, several loaves of bread, a leek, a cabbage and a sliced eidar cheese on top. Above the table are two rabbits and to pheasants hanging from racks as well as two bunches of elves ear, two garlic braids and a bunch of frost mirriam hanging from the ceiling. Further to the right on the northwest wall is a set of shelves holding two bottles of alto wine and three bottles of wine. In front of this is a long fancy table holding a bottle of wine and one of alto wine, three loaves of bread, a sliced goat cheese and two pine thrush eggs. To the right, long the northeast wall is a chair and wardrobe with a sabre cat pelt on top. At the end of the room, coming out from the southeast wall is a queen sized bed with end tables either side. The left of these holds a potion of haggling, with a medium coin purse on the floor to the left of it. The end table to the right of the bed holds four loose septims. There is an iron war axe under the bed and an unlocked non-respawning chest containing leveled items at the foot of it. Along the southwest wall at this end of the house is a food barrel and a round wooden table and two chairs. On the table are two bottles of Nord mead. Around the corner on the southeast wall is a cupboard holding two common books, a copy of The Tale of Dro'Zira and a copy of Flight from the Thalmor. There are a salt pile and bowl of troll fat on top of the cupboard and on the floor, to the right is a flower basket are three more pine thrush eggs. Berit's ashes may show back up in the residence after completing the associated quest. Picking up and reading the Lost Legends book will starts the quest Forbidden Legend. All dressers, cupboards, and end tables in the location are non-respawning. This page was last modified on 24 March 2017, at 05:28.